Sculptor and installation artist Gunter Demnig started his project “Stumbling Stones” in 1995. In Germany and other European countries it commemorates the victims of Nazi terror. Since 2004 the project has also been active in Bremen. The initiative “Stumbling Stones in Bremen” works with the support of the Bremen as-sociation “Erinnern an die Zukunft e.V.” (Remembrance for the Future) and the Regional Centre for Political Education in Bremen (Landeszentrale für politische Bildung) to in-clude the city of Bremen in Gunter Demnig’s artistic and memorial project. How could we make the lives of the victims of Nazi terror symbolically visible? Jews, Sinti and Roma, victims of the euthanasia programme, those who were persecuted for political reasons, Jehova’s Witnesses and homosexuals in Bremen? Their memory has faded to a large degree. The Stumbling Stones are intended to prevent us from for-getting. Stumbling Stones is what sculptor Gunter Demnig calls them: 10 x 10 x 10 cm cuboids made of concrete with a brass plate that shows name, age and fate of those we want to remember. The stones are set into the pavement right in front of the houses where those remembered lived. Volunteers do the necessary research and collect details of the victims and their bio-graphies; they put together information about the various groups that were persecuted. The result of this research, as well as a number of short biographies can be seen on this website. The concrete cuboids are set flush into the pavement so that only the brass plate can be seen. Therefore stumbling only happens in a metaphorical sense. So far Gunter Demnig has in-stalled over 70,000 Stumbling Stones in more that 1,300 locations,685 in Bremen alone. The artist makes the stones himself and is usually present when they are laid. Of parti-cular note in Bremen are the vocational students of the Alwin Lonke School, who have been laying stones since 2005. 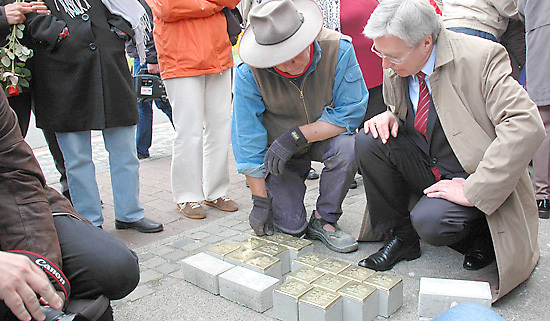 The Stumbling Stones are financed through sponsorship and receive a widespread po-sitive response from the citizens of Bremen. Furthermore, the project is generously sup-ported by Bremen council and other political representatives, which cannot be taken for granted, as examples from other towns and cities show. The Bremen initiative “Stumbling Stones” would like to thank the Senate of Freie Hansestadt Bremen for supporting the project and the local councils of Bremen for the generous financial support which has made this website possible.